Light cover wear, firm binding, frequent annotation in the text. The culture wars have distorted the dramatic story of how Americans came to worship freely. Many activists on the right maintain that the United States was founded as a "Christian nation." Many on the left contend that the First Amendment was designed to boldly separate church and state. Neither of these claims is true, argues Beliefnet.com editor in chief Steven Waldman. With refreshing objectivity, Waldman narrates the real story of how our nation's Founders forged a new approach to religious liberty. 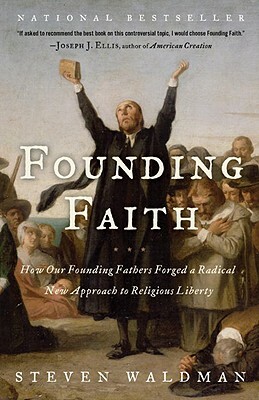 "Founding Faith "vividly describes the religious development of five Founders. Benjamin Franklin melded the Puritan theology of his youth and the Enlightenment philosophy of his adulthood. John Adams's pungent views on religion stoked his revolutionary fervor and shaped his political strategy. George Washington came to view religious tolerance as a military necessity. Thomas Jefferson pursued a dramatic quest to "rescue" Jesus, in part by editing the Bible. Finally, it was James Madison who crafted an integrated vision of how to prevent tyranny while encouraging religious vibrancy. The spiritual custody battle over the Founding Fathers and the role of religion in America continues today. Waldman at last sets the record straight, revealing the real history of religious freedom to be dramatic, unexpected, paradoxical, and inspiring.